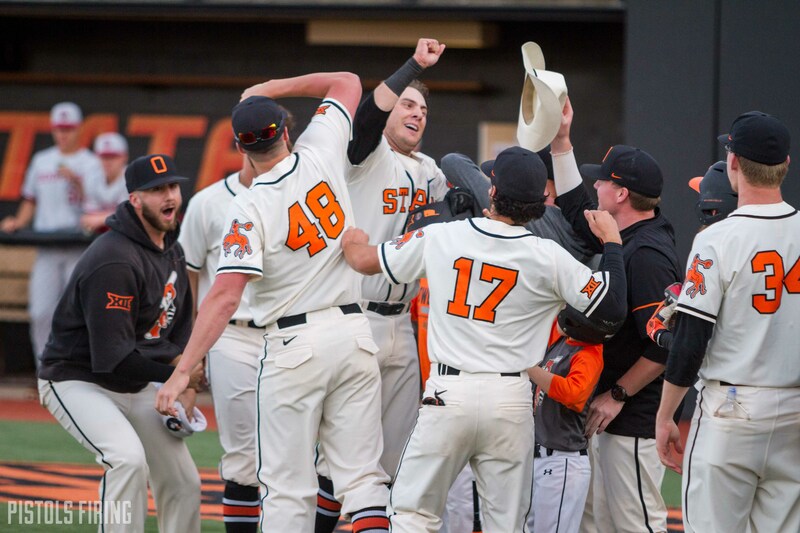 Watch: OSU Walks Off OU in Bedlam Finale at Allie P.
In the last OSU-OU game in Allie P. history, the Pokes moved their all-time record against in-state rival OU to 173-152 following a wild walk-off win. It was a fitting way to send Allie P. out in its last ever Bedlam tilt as the Pokes move into a new stadium in 2020. Max Hewitt drove in Noah Sifrit in a 5-5 game in the bottom of the ninth inning, and all of a sudden the Cowboys have won four in a row and eight of 10. As Marshall Scott pointed out in his excellent five thoughts, OU won just one game at Allie P. in the 2000s, and Josh Holliday has dominated them overall. The Pokes end their Allie P. history 19-15 against the Sooners. After so many long evenings in that stadium between those two teams and so many battles and (literal) fights, it was the perfect sendoff into 2020. The two teams will play again in Tulsa, OKC and Norman in May.